Life continues as it does here. There have been struggles and setbacks, nothing special, but that is boring. Wait, maybe you wanted to hear The Saga of the Sleep Study: The Quest for a New CPAP (with surprise BIPAP ending), but you'll have to wait for the eighth, and possibly final chapter next month before that story can be told. So, while we're waiting to not tell that tale, what do we discuss? Hmm...well, I had a knitalone instead of a knitalong due to a communication issue. The pattern is Springtime Bandit by Kate Gagnon Osborn, in Knit Picks Shadow, TheLastChanceForThisColorwayBeforeThisYarnGoesAway. This little shawl will go to family of family. Earlier this year I decided the next shawl would go to this woman, it was time for the knitalong, (or so I thought) and here we are. Speaking of what was supposed to be an -along but has been an -alone, I'm learning some Japanese. Two or three years ago, our son bought Rosetta Stone, and he did not pursue it. Then he asked us if we would go through the program with him--learn, practice, encourage, you know the drill. Well, Bruce (who already knows a good bit of Japanese) made it through one lesson and declared it frustrating. Taki has not made it through any lessons. I've bought flashcards and workbooks, and made it through the first unit. I started the second unit, and see that I need to maybe go back and do some of the first over again, as I am not doing well with it. My progress has stalled like many a hibernating ufo. Now that I mention a stalled, hibernating ufo, and since we're talking boring here, I can tell you about the sweater I'm knitting. It's not easy to make a brown blob of stockinette with too many stitches on the needle to spread out look good, so we'll just wait a bit for pictures. 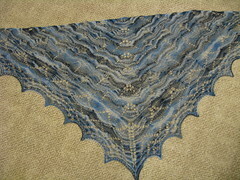 The pattern is Featherweight Wrap to Knit, and I think I will like it when I finish it. I'm just having a little trouble returning to the knitting of it after I took a break for some reason I cannot recall. So, what else have I been knitting? Well, there were the four gnomes I contributed to Project Gnome Diplomacy. I also became part of a knitalong with Stacey for Julia. I'm on the home stretch of this project, but the rows are getting a bit long. Again, we'll just wait for photos on this one, but this time it's because I'm almost done. Sure, we are likely months away from when I can wear it, but that will not stop me from finishing and enjoying. I hope you are finishing what you need to complete, and enjoying at least one thing today.